Nixa Amateur Radio Club: Boy Scout's Merit Badge a HUGE Success! Boy Scout's Merit Badge a HUGE Success! 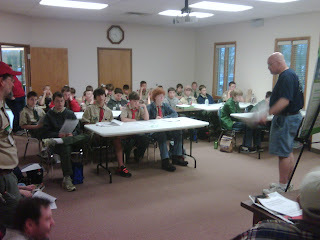 On the cool, rainy day of April 23, 2011, just a day after severe weather, club members were at it teaching 27 boys from 3 different Boy Scout troops the ins and outs so they could get their "Radio" merit badge. The radio merit badge was brought back as a "special" badge for this year only. When the club was contacted by a local scoutmaster, Terry Zembsch, KC0SQE, immediately offered to head up the project and got to work. The boys were enthusiastic and had lots of questions. It was an amazingly fun time! The morning session was mainly spent teaching the kids the basics of callsigns, radio spectrum, modulation, and basic electronics with Warren Reynolds, KD0ELT, bringing his work van and showing the boys the different types of service equipment used to work on repeaters and radio equipment and talking about repairing Highway Patrol Repeaters and Shawn Baker, KA0RZE, talking about his job repairing broadcast radio transmitters. The afternoon was a blast, too. They took the boys out to look at the antennas, and every boy was allowed to make a contact on HF. The boys were in awe that they were talking to people all over the place on HF without their cell phones! During the QSO section of the class, Kent Doucey, N0IRM, had turned around to answer another kid's question while one of the scouts was on the air telling a joke: "Do you know what the difference is between roast beef and pea soup?" The ham on the other end said he didn't know, and the scout said "You can roast beef, but you can't pea soup!" The boys were indeed fun to be around, and everyone involved enjoyed themselves. Again, thanks to everyone that participated in making this a wonderful, memorable day.